A gas explosion in a coal mine in southern China killed 48 workers on Friday and injured two others, the official Xinhua News Agency said. The blast occurred at 11:45 a.m. in the Jianxin Coal Mine in Jiangxi province, Xinhua said. All 48 bodies have been recovered, it said. The cause of the explosion was under investigation, Xinhua said. It was not immediately clear how many miners were working when the explosion occurred. A woman who answered the telephone at the Fengcheng Coal Mine Bureau, which oversees the state-run Jianxin mine, said she did not have an exact figure of how many people were underground. "It's the biggest mining accident we've had," said the woman, who gave only her family name, Yang. "We're very sad. The death toll is so high." Gangs of between 50 or 60 people worked in shifts throughout the day pulling out bodies from the explosion site. Telephone calls to the government offices in the city of Fengcheng, about 800 miles south of Beijing, were not answered. The mine, which an annual capacity of 600,000 tons, has stopped operations, Xinhua said. 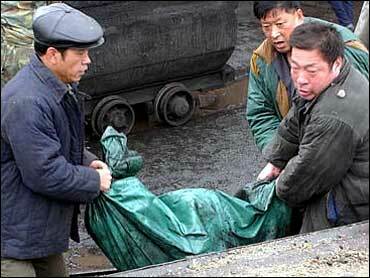 China's coal mines are the world's deadliest. More than 4,100 deaths have been reported so far this year in explosions, floods and cave-ins. Lax safety rules and lack of fire and ventilation equipment are often blamed. Chinese authorities said Friday they have shut down more than 15,400 small mines across the country because they were dangerous, according to Xinhua. Even so, another 23,500 similar operations are still running, Xinhua said, citing Wang Xianzheng, director of the State Administration of Production Safety. Small township coal mines are "usually poorly-equipped and employ untrained farmers, posing huge safety risks," Xinhua said. Officials on Friday were quoted by Xinhua as saying the trapped miners had little hope for survival because they had likely died of suffocation from poisonous gas produced during the explosion. Li Chengmin, deputy chief engineer of the Tonghua Coal Mine Bureau, also said the explosion caused many cave-ins which were hampering rescue efforts.